Manitoulin island is admired for it’s expansive number of crystal-blue lakes, stunning views of the Niagara Escarpment, brilliant cascading waterfalls, and active wildlife. But what happens when August ends and the breezy summer air develops a crisp edge? Even with the inevitable end of the bustling summer season, Manitoulin is still as breathtaking as ever. Here are some reasons why Manitoulin in October is a spectacular place to be. Many people agree that hiking is a lot better in the fall. Not only is it more comfortable than hiking in the blazing heat, but getting engulfed by the beautiful colours of the surrounding trees makes every minute magical. The resounding positive comments from visitors demonstrate the genuine appreciation and awe that embodies the island. 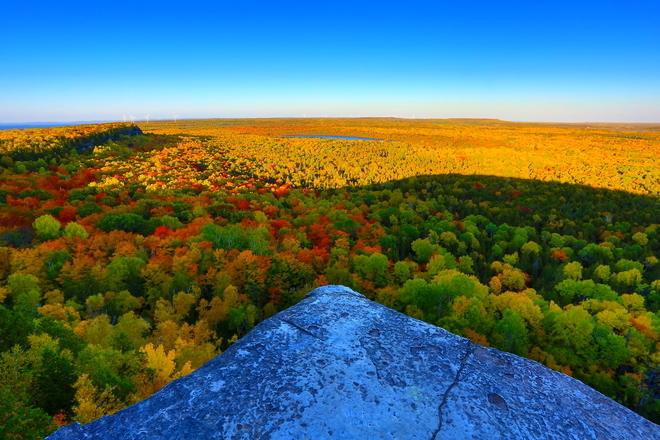 The photographer of the picture below called the view from the Cup and Saucer trail “some of the best colours I had ever seen.” And he’s not wrong. The mass of reds, oranges, and yellows resemble the swirling, chaotic strokes on a painter’s palette. It is said that the best time to see the Northern Lights (or its scientific name, Aurora Borealis) is late September to late March. That places October within this excellent viewing season, when the nights are stretching longer and the dark night sky deepens into a canvas for these beautiful flashes of colour. The open expanses of land and the dark, star-studded sky allows for a clear view of these mysterious lights. Manitoulin is recognized across Canada - and even worldwide - as being one of the best places to watch the Northern Lights. The Ojibway believed that the dancing of lights represent The Great Spirit, who they thank for helping find their way home. There are restaurants that remain open during the off-season, and 3 Cows and a Cone is one of them. We’ve created an awesome October calendar filled with great deals and promotions. Whatever you may be craving, we’re sure to have it. Visit our Udderly Good Deals page to keep up-to-date. October is the month for scary movies, getting dressed up in costumes, and trick-or-treating for copious amounts of candy. Did you know you can come trick-or-treating at 3 Cows and a Cone? On the eve of October 31st, come to the store with your kids; we’ll be giving out candy. Don’t worry, there are no tricks up our sleeve - just treats! Make the most out of your October - enjoy the beautiful sights, eat good food, and get into the Halloween spirit. October will fly by before we know it!